Crete Location Map - here is the location of the island of Crete in the south of Greece. This is the largest island in Greece with hundreds of beaches, four capital towns, three mountain ranges, forests, olive groves, vineyards and rugged gorges to explore. 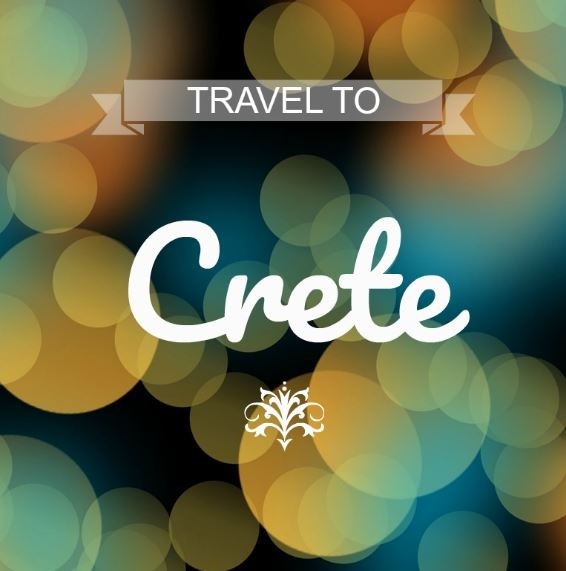 We love Crete for her beauty and her people, and we are delighted to show you around. We have created this website as a hub for those who love Crete, and to share our personal rediscovery of the island of our heritage, of our grandparents and family. Below is our selection for good maps of Crete to buy online. We like the Anavasi maps and found them very useful for general touring. What country is the island of Crete located in? What is the closest island to Crete? Crete has small islands surrouding the main island such as Chrissi Island, Gavdos Island and Dia Island. The closest nearby Greek Islands are Antikythira and Kasos, Kythira, Santorini and Karpathos. 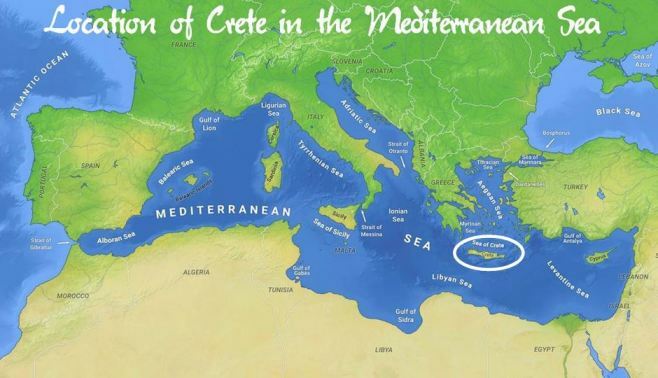 Ancent Crete is the same island, which has been inhabited for thousands of years, with the complex civilisation of the Minoans dating from 2600 BC. Many ancient sites can be visited on the island, the most intriguing being the Palace at Knossos near Heraklion. 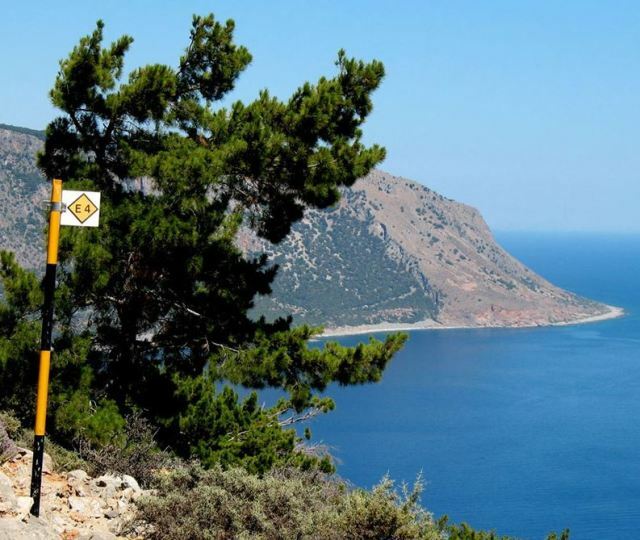 Crete Location Map - the E4 European walking path Cretan section starts in the west of the island at Kastelli-Kissamos and tracks 320 km through some of the most beautiful countryside in Crete. It finishes at Kato Zakros in the east. Or, of course, you can do it the other way around, or do bits at a time. The trail is not always marked, it has some yellow and black E4 markers along the way. It is always good to check with the locals before starting any hike or walk in Kriti, especially in the mountains. Walkers will choose the 1:25,000 Anavasi maps to detail these routes, which are featured above. The Cretan Way by Luca Gianotti is an invaluable guide for this trail. It has detailed descriptions of the route, maps, GPS references and more. Looking for trip ideas in the west of Crete? Or do you prefer to travel to the east of the island? Take some time and a car and you can explore the rugged, beautiful interior of the island of Kriti, as well as visit some sandy beaches. The capital town of each are shown below, each with their own map with our selection of accommodation for your stay in Crete. Crete Location Map - where to find real hands-on, physical, hard-copy, old-fashioned maps in Crete. In Chania visit Mediterraneo Bookstore at 57 Akti Kountourioti Street on the western side of the old harbour. They have a wide range of guides and maps, walking maps and hiking maps. And a good map of Chania town. In the Old Town of Rethymnon visit Mediterraneo Editions at 41 Palaiologou Konstantinou Street, just around the corner from the leondaria, for a wide range of books and maps including hiking maps. 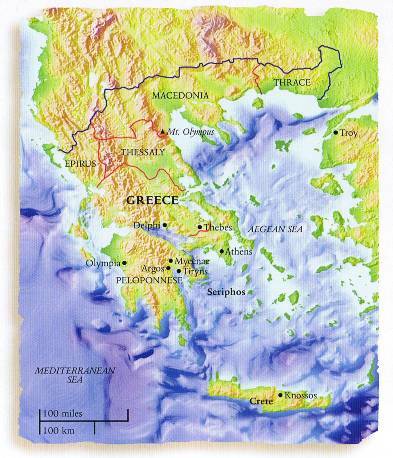 A good place to find a wide range of excellent maps is Taxidiotiko Bibliopolio ~ Travel Bookstore on 29 Chandakos Street in Heraklion (just walk down between the trees from the liondaria). You can find road maps, walking maps and hiking maps with good detail. Here is also a good map of Heraklion town. In Agios Nikolaos visit Karteri at 5 Roussos Koundouros Street on the eastern side of the harbour. Here you will find a wide range of guides and maps as well as foreign language books and Greek dictionaries in many languages. Crete Location Map - many people get to Crete by ferry from Athens. Alternatively, the flight is only 1 hour duration and you can get to this beautiful island to begin your travels without the long overnight trip on the ferry which is 6-9 hours duration. Once in Crete, it is also your call as to whether you hire a car or take the local buses. Both are totally viable and have their own pros and cons. The local buses are comfortable and efficient and a pleasure to ride on, and we have travelled all over the island easily on the buses. See more about all forms of transport with information and booking options below.